Place potatoes in large saucepan; pour in enough salted water to cover potatoes. Bring to boil; reduce heat to medium. Cook for 20 to 25 minutes or until potatoes are tender. Let cool completely. Cut into 1-inch cubes. Meanwhile, whisk together yogurt, lemon juice, olive oil, mustard, honey, garlic, salt and pepper until smooth. Toss potatoes with dressing. Stir in tomatoes, bacon, chives and parsley until combined. Can be covered and refrigerated for up to 8 hours in advance of service. Just before serving, fold in avocados and romaine. Makes 8 quarts. Serve portion (1 1/3 cups/8 oz per serving) as side dish or appetizer. 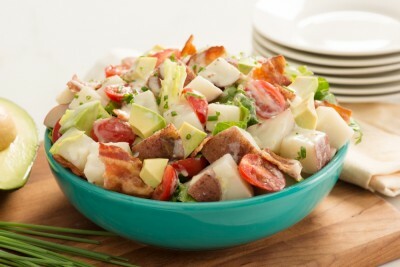 Tip: For fully loaded potato salad, add 12 chopped hard-cooked eggs.